When I was quite young, I was told "no one will pass Grade 5 without memorizing the multiplication table!" With fear and dread I did somehow pass despite my teacher's grim prediction, and even progressed a little further without learning my tables. Once my enemy, now my friend, those old tables which once seemed to bar my educational progress now appear to me full of interest and beauty. Is there a pattern to how the numbers in the table grow? Sure there is, and its hyperbolic. 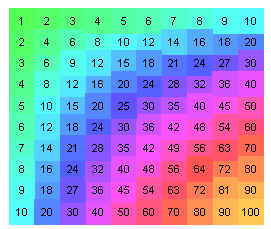 If you color in the numbers of the table according to their magnitude, you might notice bands of color that curve in an almost rainbow-ish fashion. See here for a bit more on this. 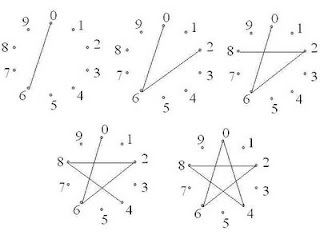 Different numbers sometimes give the same stars, but joined in a different order - maybe you can figure out why. For a little more on this, see here. 3. How often do numbers appear? How many times does a given number appear in a multiplication table of a certain size? How often do primes appear? How often do composites? What number appears most frequently? 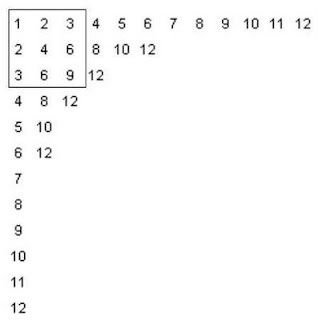 Not too surprisingly, the number of times a number shows up in a multiplication table depends on how many ways you can multiply two numbers together to get that number. So, a prime is only going to appear twice (on the top and left borders of the table). 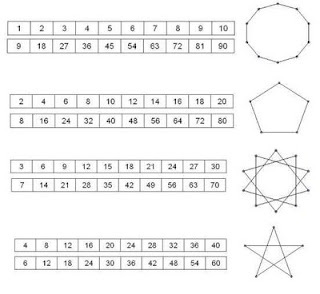 As you explore these questions, you may find that the answers would turn out a whole lot nicer if only we used a slightly different kind of multiplication table. 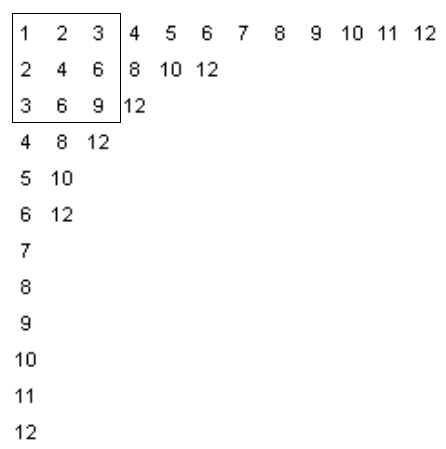 That's what I found anyway, and it lead me to look at an extended multiplication table. These are a pain to write out (use a computer if you can) but have lots of nice properties. Below is a picture of the extended 12 table (which contains a standard 3x3 table). The rule for writing these out is that you make each row by skip counting up to a given number (12 in this case). For a little more on factor lattices, see here, and this post gives some information on how these lattices are connected to the extended multiplicaiton table. 3. What is the average of the numbers in the table? Why go out and gather data to do your "data management" activities when you've got a nice slab of numbers hanging on your classroom wall? What is the average of all the numbers in a multiplication table anyway? And all the rows are like that, so it makes it a lot quicker if you determine the sum of the first n numbers once, and then re-use it. If you find the mean of the table, you'll notice that the average of all the numbers in the table is equal to the average of the number (or numbers) in the table's exact center. In other words, the average is also the average of the middle. If you use an odd number for n the mean of the table is equal to the single number in the middle (try it for a 3x3 table if you want to do it quickly). 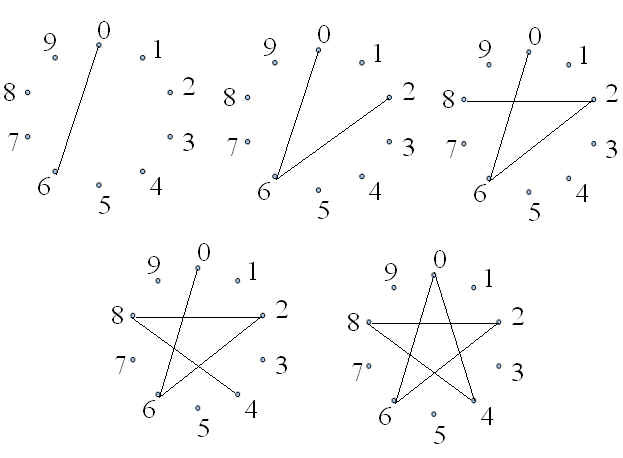 If you choose an even number for n (like the usual 10 or 12), then there is no number in the middle and you need to take the average of the four middle numbers. Once you start adding up entries in the table, you might come across some other surprises. For example, the sum of the entries in the main upwards diagonal and the diagonal above it is equal to the sum of the entries in the main downwards diagonal. Some on this here. 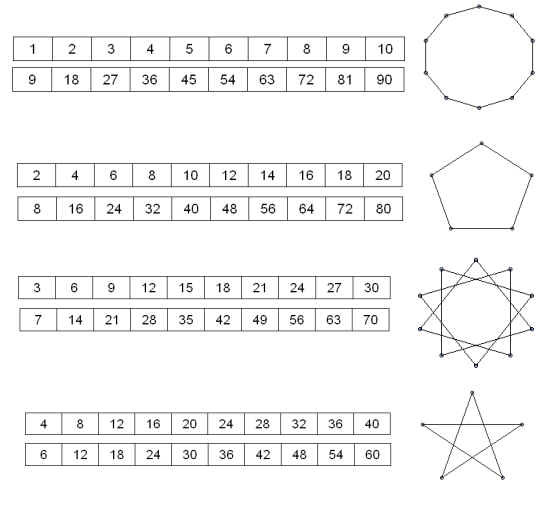 One other thing that might go unnoticed is that if you sum just the numbers above and including the upward slanting diagonal, you get a special kind of number known as a "triangulo-triangular" number (see here).